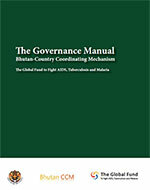 Bhutan Country Coordinating Mechanisms (CCM) is comprised of members representing government, private, civil society, people living with diseases, faith based organizations, and multilateral and bilateral partners. A CCM is responsible for submitting proposals for GFATM financing, nominating the PRs and overseeing grant implementation. The CCM was reorganised and more formally established in March 2011 in keeping with GFATM guidelines and has 20 members, a majority of whom represent civil society organizations. As a prerequisite to accessing funds from the GFATM, every country is obliged to organize itself through the establishment of a CCM. An independent CCM Secretariat under the supervision of the CCM Chairperson handles the day-to-day functions of the CCM. Since the advent of GFATM in Bhutan (April 2005), the Ministry of Health (MoH) has been the Principal Recipient (PR), implementing the grants to fight the three diseases. The Global Fund to fight AIDS, Tuberculosis and Malaria (GFATM) is a multi-billion dollar international financing mechanism formed in 2002 to scale up financing in lower income countries. The Global Fund Secretariat based in Geneva, Switzerland manages the grant portfolios, including screening of proposals, authorizing disbursement of funds and ensuring that grant approvals are performance-based. More generally, the Secretariat is tasked with executing Board policies; resource mobilization; providing strategic, policy, financial, legal and administrative support; and overseeing monitoring and evaluation. Copyright © 2019. Bhutan CCM. All Rights Reserved.